DJ Seizure the most underrated DJ has surpassed his levels in the DJ game. Starting back in high school DJ Seizure discovered his love for music. "It all started when I moved to Broward and started throwing crazy house parties," said Seizure. In, 2000, Seizure got his first DJ set and since then he could not let go of the turntables. His first impression towards the public was at a house party, where he realized how much the audience reacted to his skills. Subsequent to that, party Seizure received calls to attend other parties to perform one of many at Flanagan High School for various school celebrations. When he was 18, he was found spinning at local clubs known as Club Exit, Coliseum and Tropics. In 2005, Seizure moved away to Orlando to pursue his music career further at Full Sail Real World Education where he established his Associates degree in Recording Arts and Bachelors in Entertainment Business. In completion to his degrees, Seizure moved back to Miami and continually works with his group Dream Team, as well as interning for Poe Boy in December 2008. In 2009, Seizure was significantly recognized and signed by a small group called DMG, who was a rising immensely within months as one of Miami’s hottest hip-hop bands. “2009, I can say was one of my best years at the time getting me noticed by many clubs, bands, artists and by the Hitt Breaka DJ's, Atomic Storm DJ’s & Slip N Slide DJ’s.” DMG later grew apart and Seizure pursued his DJ career solo. Since then, DJ Seizure has used his ability on the turntables as well as on the internet thru online promotions to get his name across the country. Using his promotional tools, he was contacted by DJ Aspekt in the spring of 2010. Within weeks afterwards Seizure was promoted as President of All Out All Star DJ’s, which has grown as a dominant worldwide coalition. Reaching out to about 50+ DJ’s worldwide from Miami, California, New York, St. Louis and now UK. His ability to network and get the name across has been significant for the All Out Records family. “I’m very thankful to be apart of the All Out family, for with their help I was able to get to where I needed to be in the game.” His recent shows with Shoe Gallery, Top Mics & Fifty Mics during memorial weekend gave him the opportunity to also network and now work with Poe Boy as well as perform during the Coast 2 Coast Mix tapes 4th of July Pool Party & BBQ. From then on it has been nothing but skyrocketing as Seizure went on to have his show on the Coast 2 Coast Radio and spinning at the hottest clubs in Miami such as Space, Karu & Y, and many more. "Right now i'm just building my name and it's growing significantly thanks to everyone who supported me." DJ Seizure as a brand has grown immensely in the past 2 years. So much that Coast 2 Coast Mixtape DJ’s has recognized his talents and brought him aboard as their official Miami Coast 2 Coast Industry Mixer DJ. Spinning for the likes of BIgga Rankin, DJ Epps [Power 96], DJ Demp, Steve Raze, Short Dawg and more. These events clubs, mixers, etc., have helped him prove to be one of Miami’s most up and coming and underrated DJ. With that being said Bigga Rankin acknowledged his career and named him the 2012 Diamond Award Club DJ OTY. “Being honored by one of Hip-Hop’s most prominent and biggest DJ’s in the game was such an epic event and award. I can only thank those who helped bring my career to this level fans, co workers and family.” Other major talents DJ Seizure has had the privilege to DJ alongside include DJ Boof [Wendy Williams Show], & DJ Entice [99 Jamz], Jim Jones, Juelz Santana, YC, Yung Berg, French Montana, Lebron James, Red Café, Fabolous, Meek Mill, Gucci Mane, and many more. With Seizure branding his name and logo nationally and now globally. He has captured the eyes of sponsorships from HydroVape Pens. He is now the resident DJ at Bongos Sky Lounge in The Hard Rock Hotel & Casino in Ft. Lauderdale. 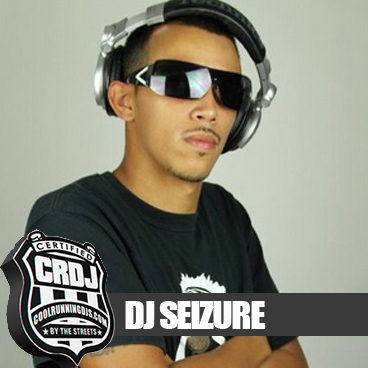 To start the year off right DJ Seizure has once again been nominated for the 2013 Club DJ OTY Diamonds Award.